Collateral mortgages are a shrewd way some major Canadian banks effectively trap their clients and make it difficult and expensive to ever switch lenders, even at the end of a mortgage term. The only leverage you have when negotiating with a lender is to “go elsewhere” and collateral mortgages makes this more difficult as it increases the switching costs considerably. Most borrowers are not even aware they have a collateral mortgage until they want to switch. TD Canada Trust was the first major bank to switch all their mortgages to be collateral mortgages. Their practice has been to register a collateral mortgage against their client’s property up to 125% of the property value and register a much higher rate than they are currently charging. They pitch this “feature” as being great for clients should they want to borrow more money in the future since the collateral mortgage may already be as high as 125% of the value of the property it is easy and cheap for the bank to increase the mortgage size or loan more money. However, this benefit effectively locks in clients as there are additional legal costs in switching to another lender. Banks know this and will offer higher rates come renewal as they know your switching cost is now much higher. Switching a collateral is sometimes possible in theory, but in practice virtually no lenders will take one over so you’re stuck paying the fees to get out of it. Many major banks now offer collateral mortgages (only a few offer them exclusively) so be sure to ask your Lawyer before signing your mortgage if that is what has been offered. Experience has shown even many retail bank mortgage specialists don’t even know that their mortgages are collateral rather than conventional. Also ask your lawyer to review the banks collateral loan agreement (which is separate and not registered on title the way a regular mortgage is). It can contain additional terms allowing the lender to increase your interest rate among other things which may give you a big surprise down the road. Bottom line: Watch out for collateral mortgages they make switching more expensive and decrease your negotiating power which will cost you. It’s not uncommon for lenders to send early renewal option to clients a couple of months before the term of the mortgage is up. What most folks don’t realize is that if they accept those rates, they are paying considerably higher than what they could get elsewhere or even from their current bank if they wait. Consider the early renewal your banks first offer. The price of a “easy” renewal is a higher rate which can cost thousands of dollars over the term of the mortgage. It’s important to shop around when its mortgage renewal time. Every lender wants to make as much money as possible on their loans, so they don’t make it easy to get their best rate. Shop around or better yet let me shop around for you. Every person that offers a mortgage is required to offer mortgage insurance. This is another example of “easy” not being best. See mortgage insurance section for a more in depth outline of why mortgage insurance is usually not in your best interest. But suffice to say, mortgage insurance is a very lucrative operation for those offering it and it’s often implied as a requirement of the mortgage. Life Insurance is cheaper, lasts longer, is more likely to pay-out upon a claim and does not tie you to any lender. Getting this right could save you thousands of dollars over the life of your mortgage. Imagine putting all that wasted money against your principle! Everything else being equal, your mortgage rate is very important. But everything else is not equal. At the end of the day one of your mortgage objectives should be to pay the least amount of interest possible and own your home as quickly as reasonably possible given your cash flow. While rate does directly affect this, there are other factors that can save you enormous amounts of interest and pay off your mortgage years sooner. 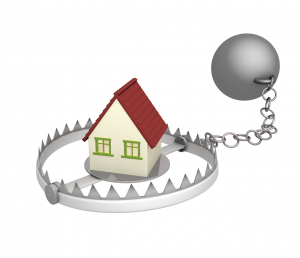 Mortgage penalties are important to consider. While none of us plan to break our mortgage early, there are often times when breaking it is necessary. Often when selling your house you’ll have to pay a penalty to break your mortgage. Should rates drop considerably and you wish to refinance at a lower rate you may want to break your mortgage to save on interest. It’s important therefore to keep an eye on what your penalty is. Those “low rate” mortgage specials often have higher penalties attached to them. You could find yourself further behind even with the best rate if you don’t consider the penalty you might have to pay. As with Mortgage Trap #4, while rate is important your pre-payment privileges are often more important. Since your objective hopefully is to pay down your mortgage quicker than the default 25 year amortization, thus saving yourself tens-of-thousands of dollars in interest, you’ll want to consider prepayment privileges when getting your mortgage. You should also make an effort to use these terms as most people simply pay the minimum required. For some folks it makes sense to pay down your mortgage now, and wait to invest in your RRSP – Let’s chat. A portable mortgage is one you can take with you. If you do get a great rate, with great terms you may want to port your mortgage to your next house and keep the same lender. This not only saves you penalties, you also get to keep your great rate and other features. Not all lenders provide this option. Home Equity Lines Of Credit (HELOC) are unique mortgage products that if used correctly could save you substantially on interest and take years off your mortgage. They also provide enormous flexibility with regards to payments and re-borrowing. But like any powerful tool, if not used correctly they can be disastrous. HELOC’s are mortgages that can behave like a revolving line of credit. A couple of lenders have them setup in such a way that they become your bank account, mortgage and line of credit all at once. Why is this a good idea. Your mortgage is usually the cheapest debt you’ll ever have because it is backed up with an asset that generally appreciates in value. Thus if you can pay off any other debts (which are at higher rates), you save money on interest. Most people have a savings account and a cheqing account and sometimes and investment account. Problem is most of those don’t pay much interest. Meanwhile you’re paying interest at a higher rate on your mortgage. With a HELOC you can deposit your savings against your mortgage which will save you way more interest than you could have earned in any savings or chequing account. Also since your mortgage isn’t tax deductible, your savings may be even higher. Because HELOC’s are like big lines of credit against your house, you can put your “emergency fund” (several months wages) against your mortgage, rather than in a low paying savings account. 4. Every Penny Is Saving You Interest! On a day-to-day basis, you deposit your paycheck into your all-in-one account and lower outstanding debt and therefore lowering your interest payments. When you purchase something on debit (or pay off your credit card) it increases the size of the loan. You effectively have all your available money against your mortgage every day of the year. This saves interest and could help you pay down your mortgage much faster! These can be huge money savers for clients who are disciplined in saving money. It can simplify your financial life, and save you substantially on interest if used correctly! If you have trouble budgeting and are not disciplined with your money this can be bad news. As you can continue to borrow, you erode the equity of your home should you routinely be spending more than you make. HELOC’s provide great flexibility and big financial benefits as they can substantially lower your total interest payments by consolidating debt, but abused they can cause great financial hardship as in theory you can simply pay interest and never actually pay down your mortgage. It is also important to note, HELOC’s are a type of collateral mortgage. Meaning they are more costly to switch from lender to lender with. But if you’re using a HELOC properly you won’t need to switch. These are the only collateral mortgage products I’d recommend.